TerraCRG has been retained to exclusively represent ownership in the sale of 759-763 Manhattan Avenue, a 20,027 square foot mixed-use building in Greenpoint, Brooklyn. 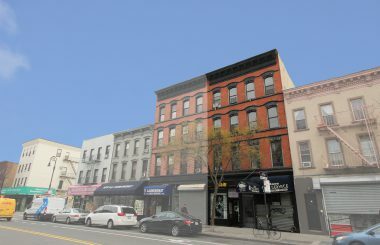 This is a unique opportunity to acquire 50 feet of retail frontage in the heart of the Manhattan Avenue retail corridor, with the ability to add value through the rehab of the upper residential floors. The building consists of two net-leased ground floor retail spaces and 16 residential units above, ten of which are either currently free market or prime for deregulation after renovation. The retail spaces are occupied by The Mattress Firm, a publicly traded company (MFRM, formerly Sleepy’s), and J & Z Liquor. Both tenants are paying an average of $102/SF and both leases expire in 2019. The Mattress Firm has a fixed annual rent while J & Z Liquor has 3% annual increases. The residential portion requires a gut renovation, which will allow for increases in the income through major capital improvements (MCI). Combined projected income for the entire property, upon completion of the residential renovation, is ~$785,358, with additional upside in the retail as leases expire. 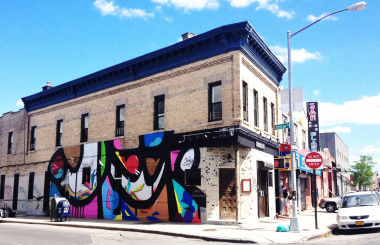 Greenpoint is going through a remarkable transformation, particularly along the waterfront. Greenpoint Landing, one of New York City’s largest developments, is located just a few blocks west of the subject property and is set to deliver 5,500 units of affordable and luxury housing occupied by 13,750 new residents. The first 300 units are slated to be complete in the coming months. Manhattan Avenue, particularly this section, is one of the strongest retail corridors in Brooklyn. The area offers a unique mix of local and national retailers, including TD Bank, T-Mobile, Sprint, Radio Shack and Rite Aid. The property is one block away from the Nassau Avenue G train and a short walk to the India Street Ferry stop providing just a 30-minute commute to Midtown.